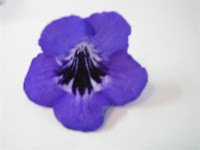 North Star African Violet Council Twin Cities: Guest Hybridizer!!!!! Welcome! 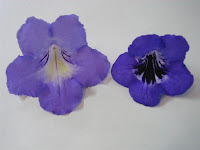 Let's talk about all things relating to the growing, showing, hybridizing and appreciation of African violets and gesneriads. And while we're at it, anything else that's interesting about plants too! This cross was made last winter and seed was sown in late May. The first seedlings started blooming in October. The seed was ready earlier, but I had to wait until my annuals, perennials, and vegetable transplants were outside before I had the time and shelf space. Anyways, it is a cross between Bristol's Party Boy and Inky Frills, two of my favorites. Many of the seedlings are similar to each other, some look almost identical to Inky Frills which seems a little unusual since it was the pollen parent. Several have yellow throats. Not all of the seedlings from this cross have bloomed. So far one seedling is showing fantasy. According to Dale Marten's Hybridizing Notes, fantasy seedlings are very difficult to get. Once the fantasy seedling gets a little bigger, I plan on selfing it to see if the fantasy improves any. I don't think there is anything too unusual about the seedlings so I am not planning on naming any, but I will keep a few of my favorites. Photo "B-Strep cross BPBxIF Grouping" shows a grouping of some of the seedlings from this cross and all of the blooms in this photo are from different plants. Shown in photos "D-Strep cross BPBxIF Seedling", Z1 and Z2, is probably my favorite so far. In person it is very brightly colored with a white throat and dark lines. **I would like to welcome and thank M. Wheeler for sharing these photos and crosses with this blog!!!! How exciting to see what different traits and characteristics are passed along to the offspring. *** NOTE click on the photo to make it full size for a closer view. Please join us at the next meeting! Guests and new members are always welcome! Meetings are now going to be usually on the second Saturday of the month. Location to be determined. Meeting time starts around 10:30 am and goes to approx. 12:30. Guests are welcome! New members are very welcome! You may contact us at any time at nsavctc@gmail.com for times, directions, questions and comments. Royal Rage! What stunning flowers. Quilted: Leaf type. Describes an African Violet leaf on which the areas between the veins are raised, giving the leaf a puffy, distinctively quilted look. A otherwise plain leaf, with only slightly raised areas between the veins, is called a tailored leaf. Thanks to the Optimara Glossary for this resource! 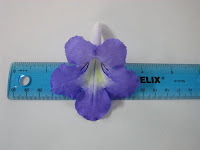 What do you call this pattern on a blossom? The Lakes Area Violet Growers. Contact Jude in care of this blog . The African Violet Society of Minnesota. Contact Kathy in care of this blog. The Twin Cities Chapter of the Gesneriad Society. Contact J.S. in care of this blog. Or our group, The North Star African Violet Council. Again, to reduce the incidence of 'spam' please contact any or all of the groups at nsavctc@gmail.com - the email address for this blog.